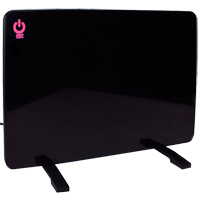 The Cozy Legs Flat Panel Radiant heater offers a safe and energy efficient alternative to traditional space heaters. Rather than trying to inefficiently heat large volumes of air, the Cozy Legs panel relies on "Radiant" heat transmitting directly from the surface of the panel to all exposed surfaces in close proximity to the panel. As these surfaces warm they can also begin to gradually transfer warmth to the air in the immediate vicinity via convection, slowly increasing the overall area being warmed. This makes the Cozy Legs an ideal solution to increase personal comfort in semi-enclosed areas below desks, where windows are leaching heat, or where a single person requires a slightly higher degree of warmth than others sharing the workspace. The small footprint and dimensions also make it well-suited to placement on a desk surface to provide warmth to cold hands. Because the transfer is direct from surface to surface the panel does need to be in reasonable proximity, with the intensity of the heat transfer directly related to the distance the receiving object is located from the panel. Optimum results are probably within the 10" - 14" range, with greater intensity at closer range and decreasing intensity beyond that distance. The Cozy Legs uses only 200 Watts when operating at the HI setting, and is ETL Certified as a Zero Clearance Item which means that even when touching combustible materials there is no fire hazard. It also includes wide support feet which facilitate positioning the unit on any flat surface, in either vertical or horizontal orientations. A Hi-Lo-Off switch on the cord provides 2 levels of heating intensity and includes a light to indicate when unit is powered on. If further control and convenience is desired, the optional corded remote HI-LO-OFF switch accessory provides quick, convenient control of both levels of radiant heat. This prevents the need to potentially crawl under your desk to turn the unit off and on. A glowing indicator on the face of the panel notifies the user that the unit is actively heating. Note on Cozy Legs Technology: Radiant heat is the transfer of heat from a hot object to a cooler object through space and typically works best in enclosed spaces (i.e. under a 3-sided desk). This is distinct from convection heating (e.g. space heaters) which heat the air in order to transfer heat. Le radiateur à panneaux plat Cozy Legs offre une alternative sécure et éconergétique aux radiateurs traditionnels. Plutôt que d'essayer de chauffer inefficacement de grands volumes d'air, le panneau Cozy Legs transmet la chaleur «radiante» directement de la surface du panneau à toutes surfaces exposées à proximité immédiate du panneau Cozy Legs. À mesure que ces surfaces se chauffe, elles peuvent également commencer à transférer progressivement la chaleur à l'air immédiat et chauffe lentement la surface principal. Cela fait le Cozy Legs une solution idéale pour augmenter le confort personnel dans les espaces semi-fermées sous les bureaux, ou pour les fenêtres qui coulent la chaleur, ou pour une personne qui exige un degré de chaleur légèrement plus élevé que d'autres personnes partageant l'espace de travail. Parce que le transfert est direct de la surface à surface, le panneau doit être à proximité raisonnable, avec l'intensité du transfert de chaleur directement liée à la distance entre l'objet à chauffer et le panneau Cozy Legs. Les résultats optimaux se situent probablement entre 10 et 14 pouces, avec une plus grande intensité à une distance plus proche et une intensité moin intense si la distance est plus loin. Le Cozy Legs utilise seulement 200 watts quand il est activé sur HI, et il est certifié ETL comme un dégagement zéro (ETL Certified, Zero Clearance Item) ce qui signifie que même en contact avec des matériaux combustibles, il n'y a pas de risque d'incendie. Il comprend également des pieds de support qui facilitent le positionnement de l'unité sur toute surface plat, dans des orientations verticales ou horizontales. Un Hi-Lo-Off switch sur le fil fournit 2 niveaux d'intensité de chauffage aussi qu`une lumière pour indiquer quand l'appareil est activé. Si un contrôle et une commodité supplémentaires sont désirer, l'accessoire HI-LO-OFF switch permet un contrôle rapide et pratique des deux niveaux de chaleur radiante. Cela évite d'aller sous le bureau pour l`activer ou à l`arrêt. Veuillez noter sur la téchnologie du Cozy Legs: La chaleur rayonnante est le transfert de chaleur d'un objet chaud à un objet plus froid à travers l'espace et fonctionne généralement mieux dans des espaces semi-fermées (c'est-à-dire sous un bureau à trois côtés). Ceci est distinct du chauffage par convection (par exemple des appareil de chauffage (space heaters) qui chauffent l'air afin de transférer la chaleur. 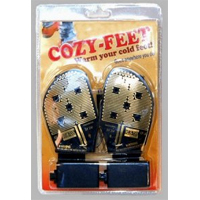 Cozy Feet are a polyester insert with super-thin embedded brass coils connected by flexible wires to two regular AA batteries. The batteries fit in a small pouch and attach to your ankle or calf with a Velcro strap. One size fits all, any shoe or boot (even waterproof ones). PORTABLE - Only 4.5" long x 2.875" wide x 0.25" thick. Inserts will go anywhere and are unnoticeable in any shoe, boot, or slipper. Move as much as you'd like - you're not tied to an electrical outlet. LONG LASTING - Powered by battery - won't lose its effectiveness like microwavable or reactive-chemical heating elements. 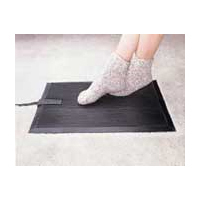 The Cozy FootWarmer heated rubber floor mat is a compact, safe, waterproof, and energy efficient solution to keeping feet warm and cushioned in chilly conditions. Many space heaters draw up to 1500 Watts of power and can be a fire safety hazard. 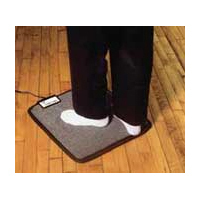 The insulated Cozy FootWarmer and the Super FootWarmer use only 90 and 135 Watts, respectively and are ETL certified. The heat generated is sufficient to warm cold feet through shoes or boots, making it beneficial for standing workstations. The heating element produces uniform radiant heat and is thermostatically controlled so that the heat remains at a constant temperature. It is ideal for use on hard, cold impervious floors such as concrete, tile or stone (i.e. warehouses or shop floors). NOTE: Certain less durable surfaces such as carpet or wood may discolor over time with even the gentle heat generated by the FootWarmer, and as such use on these surfaces is not recommended. Alternatively, place a sheet of cardboard under the mat to provide insulation. 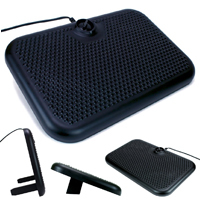 The Cozy Toes carpeted foot warmer offers a safe, energy efficient alternative to traditional space heaters. Many space heaters draw up to 1500 Watts of power and can be a safety hazard as the device can have hot spots which can be painful to touch and when combined with combustible materials can even pose a risk of fire. The Cozy Toes uses only 50 Watts and is UL Listed, creating a warm, soft, heated carpeted surface for your feet on even a cold, hard floor. The unit comes with a simple on/off switch however an optional HI - LO - OFF switch accessory provides easy access to different levels of heat. The Toasty Toes Foot Rest Radiant Heater is a safe, energy efficient alternative to traditional space heaters. Toasty Toes uses only 105 Watts and unlike inefficient space heaters it delivers targeted radiant heat directly to where it is needed - the cold feet and legs of the user. The Toasty Toes Foot Rest is adjustable to three different positions and provides the ergonomic benefits of most basic foot rests with the added benefit of radiant heat. This results in a solution which works well for almost any station where a person is seated. Feet may be rested comfortably on the heated device while working at a desk in the home or office, watching television or reading. The Toasty Toes can be also adjusted to the upright position and used as a heated panel nearby for standing workstations. The Toasty Toes heated footrests are especially suitable for applications where multiple users require a personal heater as it allows individuals to adjust the temperature of their personal space without overloading electrical circuits. The Cozy Legs Classic Flat Panel Radiant heater offers a safe, energy efficient, and attractive alternative to traditional space heaters. The Cozy Legs Classic uses only 150 Watts, and is ETL Certified as a Zero Clearance Item which means that even when touching combustible materials there is no fire hazard. 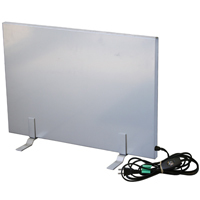 The unit can be mounted to a desk or wall with the supplied adhesive mounting pads. It also includes a basic floor stand which allows optimal heating benefits by permitting positioning the unit in the ideal location and orientation. A backlit On/Off switch on the cord about 2' from the plug provides a clear visual indicator of whether the unit is on or off. If further control and convenience is desired, the HI - LO - OFF switch accessory provides quick, convenient access to turning the unit off and on, and different levels of radiant heat. This prevents the need to potentially 'crawl under your desk' to turn the unit off and on. Note on Cozy Legs Technology: Radiant heat is the transfer of heat from a hot object to a cooler object through space and typically works best in enclosed spaces (i.e. under a 3-sided desk). This is distinct from convection heating (e.g. space heaters) which heat the air in order to transfer heat. The Eco-Save Heater is a compact energy-efficient space heater which will keep small offices comfortably warm throughout the day. It is rated at 750 watts (drawing only slightly more power than contemporary computers), and features both an adjustable thermostat and variable fan speed control. 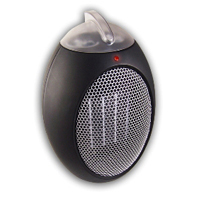 The Eco-Save Heater has an option to solely provide air circulation in "Fan Only" mode (i.e. the heating elements are deactivated). The Eco-Saver is a compact and portable heater which can be placed where the heat is most needed (on the desktop for cold hands, under the desk for cold legs, etc.) The heater is ETL Listed and has a safety feature which automatically turns the unit off if it is tipped over or if the element begins to overheat.